Google made it? Oh sweet. I don’t have to worry as much. So I fire up VoiceOver, macOS’s screen reader and start testing. How do you describe an interface? So suffice to say it’s a really important piece of technology! So, how do you build an Accessibility Tree? Names are a short identifiers used to describe purpose. So, how do you build these interface components? And presto! We have a dialog component! Meaning it didn’t anticipate the sheer amount of information we’d be throwing at it. So, how do we help prevent this? Using things like the button element for buttons instead of ARIA slapped on a div helps lessen the amount of guesswork the Accessibility Tree has to do when it runs its heuristics to slot meaningful content into its description of the current state of things. This is an example of what the language might look like when we’re speaking machine directly to machine. What going on here, and why should you care? That might seem like a lot of wiggle room at first, but take a moment and think about the templates of the sites you’ve worked on. Cobbling up a rough prototype, we were able to create an environment that mimicked the conditions of the site we were auditing, only using the new radio input code and guess what? It worked! VoiceOver didn’t crash! So why is this our problem? Why should we care about the fragility of other people’s software? Nibbling away at those milliseconds it takes for information to reach assistive technologies when requested. My current task is to reduce the number of accessible objects we create for html:div elements. This is to reduce the size of the accessibility tree. This reduces the amount of data being transferred across process boundaries. Part of what makes Firefox accessibility slower on Windows since Firefox Quantum is the fact that assistive technologies now no longer have direct access to the original accessible tree of the document. A lot of it needs to be fetched across a process boundary. So the amount of data that needs to be fetched actually matters a lot now. Reducing that by filtering out objects we don’t need is a good way to reduce the time it takes for information to reach assistive technologies. This is particularly true in dynamically updating environments like Gmail, Twitter, or Mastodon. My current patch, slatted to land early in the Firefox 67 cycle, shaves off about 10 to 20% of the time it takes for certain calls to return. Reducing the number of milliseconds it takes for a screen reader to start speaking after a key press from about 140 to 100 here, or from 120 to 100 there, doesn’t matter much on a fast machine. On a slow machine, that reduction is from about 230 to 250 down to 200 or 190. Here’s the support matrix for the title attribute, incorporated into the W3C’s HTML spec in 1993. It’s 26 years later and we still have a ton of interoperability problems. The slide background is yellow now! Think about it: when’s the last time you were tired, distracted, sick, or learning a new skill? Heck, when’s the last time you were drunk? The other big-picture question we need to ask is if all this work is even necessary? The most performant page is the one you never have to use, by which I mean how often can we side-step these issues by using other resources and information made available to us? 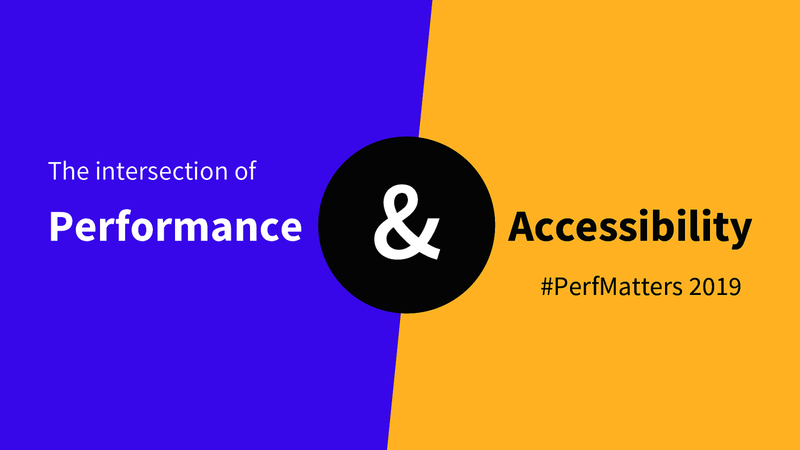 View The intersection of performance and accessibility on Notist. Accessibility is a holistic practice, essential to some but useful to all. It is a practice that touches on many aspects of good web design and development, especially performance. This talk will highlight opportunities and techniques to improve your website or web app’s performance by embracing an accessible, inclusive mindset. Speaking of amazing talks, @ericwbailey also did a fantastic talk about Accessibility and why it's important. With a great section on how not using Semantic HTML can cause the Accessibility tree to crash the browser.